We are available 365 days of the year at what ever times (within reason) you want. You can also call us anytime between 9am and 10pm everyday of the year, but at weekends we might not answer at night because we will probably be out working. What we charge depends on when the disco is (weekday or weekend), what is it for (charity, kids, adult), how long it is, where it is, and if there are any special requirements. Contact us for an exact quote. Payment can be in cash on the night, using your debit or credit card, or using PAYPAL. 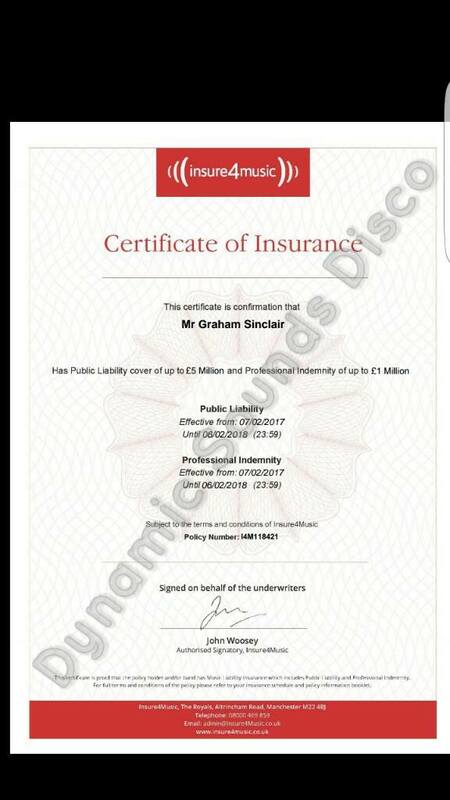 We have a Public Liability Insurance (PLI) policy covering us for £5 million and £1 million of Professional Indemnity Insurance. You should always ask any entertainment provider that you want to hire if they have PLI. How much extra do you charge for wedding? Nothing. Unlike some other discos and bands, we do not charge any more for a wedding dance, than we would for any other function in the same venue. After all it is your special day, and we don't want you to be paying over the odds for anything. What a 5 hour birthday party would cost you, a 5 hour wedding dance will cost you. The only extra you we charge is if we supply extras, for instance uplighting, or microphones for use during the speaches. Do you charge extra for a Christmas function? No. Once again unlike some, we don't add a premium onto our prices just because it is in December. What a disco would cost in November, it will cost in December. The only exemptions to this are Christmas Eve, Christmas Day, New Year's Eve, and New Year's Day. Another disco quoted me a cheaper/dearer price than you. Why do you charge what you do? If you are quoted a fee that is really cheap you need to ask yourself how are they so cheap. If they are dearer, why do they deserve to charge a premium. What we quote you is a fair price that covers our costs and experience. DYNAMIC SOUNDS DISCO Was started in 1977 by David Sinclair. Graham who now runs the disco, has been doing them for 25 years, since he was a teenager, and hefore he was old enough to do disco on his own, was helping his dad David. Graham has played hundreds of different functions (birthdays, weddings, work parties, Christmas parties, Hogmanay parties, public events etc) to thousands of people all over the Highlands. No other disco in the Highlands, and possibly Scotland, has this much experience. How much extra is karaoke? Karaoke can be added to a disco from as little as £30! Feel free to ask about it. What sorts of music do you play, and do you take requests? We will play most popular types of music from the last 50 years, and have every Number 1 song. David has been collecting music since he was a teenager, so there are very few genres that we do not have. And of course we take requests, however if you think that we may not have a certain track you want, contact us before the disco and if we don't have it we will do our level best to get it for you. I run a bar and want to use you regularly, do I get a special rate? If you run a bar, hotel, pub etc book us for 3 or more discos at one time, you will receive a discount, dependant on the number of discos. Is there any special rates for other organisations? I would like to book you, what do I do next? You can contact us on the numbers, via facebook and email addresses that are below here, or have a look at the ENQUIRY page.